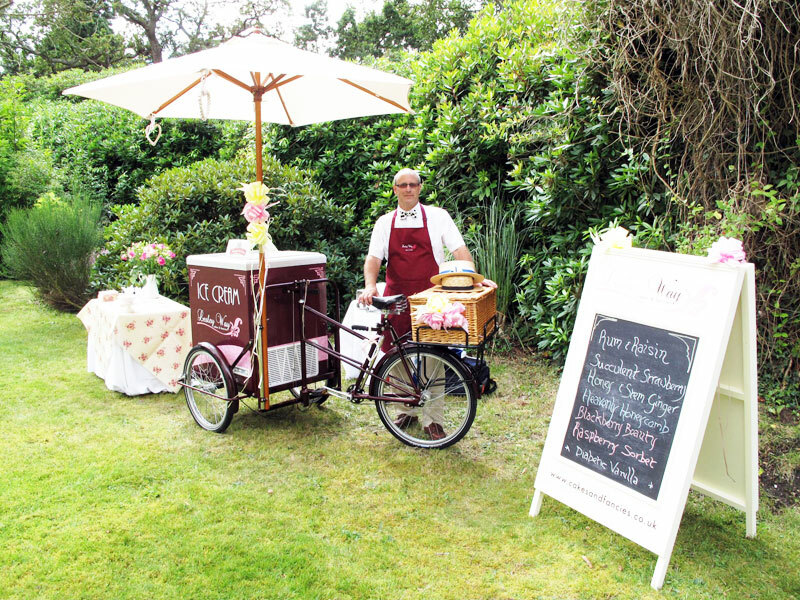 At Cakes and Fancies we are excited to be able to offer you our traditional 1930’s, Art Deco styled ice cream bike, from our base in the New Forest, for hire at your special event. 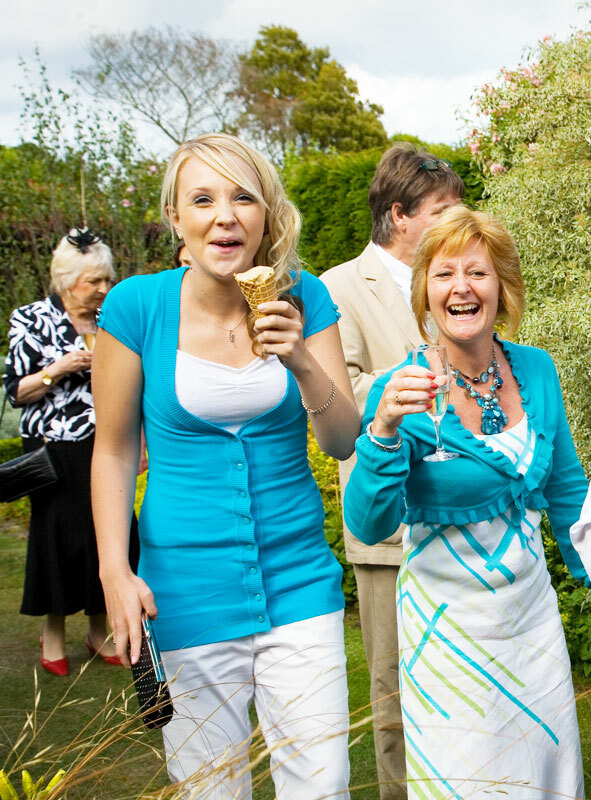 We can cater for most special events, including weddings, birthdays, fetes and corporate events. Ice cream has long been a firm favorite amongst the old and young alike. 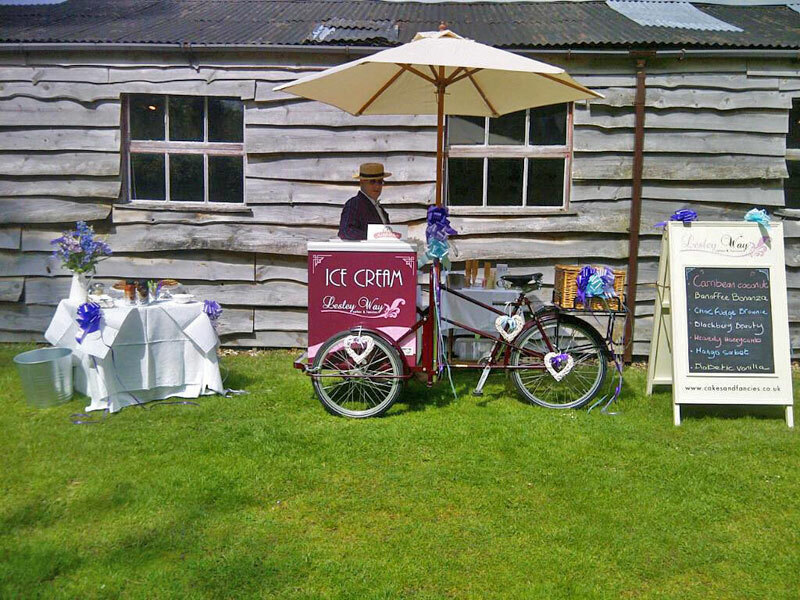 Our traditional ice cream bike will come fully decorated with ribbons, balloons or bunting in a colour of your choice, and filled with award winning Marshfield Farm ice cream, made on a family farm on the Cotswolds, near Bath. A choice of up to 6 flavours of award winning Marshfield Farm premium dairy ice cream and/or sorbet, eat as much as you like… See the current Marshfield Dairy Ice Cream Menu 2019 flavours. Marshfield Dairy Ice Cream Menu 2019. Many are gluten free too! Sugar cones and/or ice cream cups with spoon for those who prefer it, Flakes, sprinkles, and sauces, served on a decorated table with paper napkins, although this premium ice cream really doesn’t need any dressing up! One or two fully trained people, dressed in uniform, to serve your guests for approximately two hours for up to 125 people, or three hours for up to 200 people. 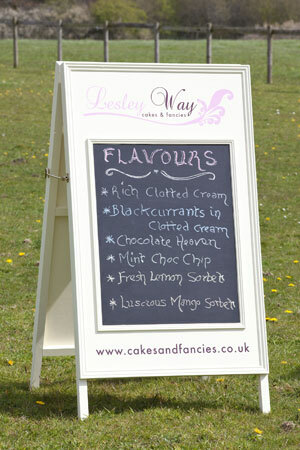 A decorated menu board with your ice creams listed so guests can choose. Travel and set up within a 30 mile radius from New Milton, Hampshire. See more photos on Facebook of events we’ve attended. All the products are suitable for vegetarians and most are gluten free too. In fact the farm is fully organic and Soil Association approved. For additional serving time, any special requirements, or for a venue outside of our standard price radius (in Hampshire, Dorset or Wiltshire), please contact us to discuss your requirements. 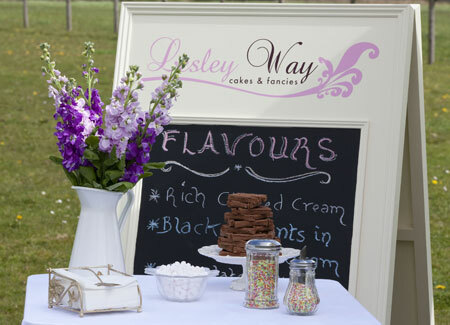 When you order a Cakes and Fancies wedding or celebration cake and hire our traditional ice cream bike for your event, we will be able to offer a small ‘package’ discount in our quotation. We can also offer an ice cream desert service from our bike to include traditional favourites like Knickerbocker Glories and Ice Cream Sundaes. Perfect for marquee and home weddings. Contact us for further details. We are happy to attend large fetes and public events with our traditional ice cream bike, where we will charge for each ice cream sold. Please contact us to discuss your event and requirements. To reflect our high standards, we’ve chosen to use award winning Marshfield Farm ice cream for our traditional ice cream bike. This premium dairy ice cream comes from a family farm on the Cotswolds and is made fresh from the milk of its own 200 strong Friesian herd. The family have been perfecting the ice cream for more than 20 years and it contains no artificial colourings, flavourings or preservatives. Every ingredient is natural. If you would like to make a booking, or for more information about our traditional ice cream bike, please contact Cakes and Fancies by email through our Contact page, or speak to Lesley directly. We will be able to check that your date is available, and send you a copy of our traditional ice cream bike Booking Form. To taste just how good Marshfield Farm ice cream is before you make a booking, feel free to come and try it. An appointment is required, and the flavours available to try are subject to what we are currently holding in stock. We will however, try to accommodate your flavour request where possible. To secure your date we will require a deposit of £75.00, with the balance payable 28 days prior to the event. Our Pashley bike is designed to carry a freezer with a built in battery, which stays cold for between 8-13 hours, once fully charged. So we can safely travel to and from your event and serve your guests with ice cream, where power is not available. Where a longer serving time is required or the weather is particularly hot, we may either request use of a normal 13amp power socket on site, or bring a small generator. We need to site the bike on a fairly level surface where possible. Please let us know if your intended site is on a slope. This is to ensure that the freezer works properly. We will need to be able to access your wedding venue with our vehicle and box trailer, with parking available for us on site. Finally! The bike is approx. 2.2 meters long and 1.09 meters wide. Please make sure that we can access your intended site for the ice cream bike. Well it just wouldn’t be Great Britain would it… If it does rain, we can bring our small gazebo to put up, where your guests can be served under cover. Alternatively, it is always good to check if your venue is happy for us to set up inside. Cakes and Fancies is a registered business with New Forest Environmental Health and we operate with fully trained staff in food hygiene. We are also covered by Public Liability insurance.